Total Bond Energies of Exact Classical Solutions of Molecules Generated by Millsian 1.0 Compared to Those Computed Using Modern 3-21G and 6-31G* Basis Sets - R.L. Mills, B. Holverstott, W. Good, N. Hogle, A. Makwana, Physics Essays, Vol. 23, No. 1, (2010), pp. 153-199. Register for a free trial of Millsian 2.1 Beta. Millsian software is built on a new classical approach to solving atoms and molecules. This approach is different from the quantum mechanical model, and has significant advantages. What are atoms and molecules according to Millsian theory? Assuming only Maxwell’s Equations, Newton’s Laws, and Special Relativity, this classical model of the atom solves the bound electron as a two-dimensional spherical membrane or shell of charge and current, completely surrounding the nucleus. It is composed of a continuous series of current paths that follow great circles, and produce angular momentum vectors which give rise to the phenomenon of electron spin. The stability of the electron is due to a result of Maxwell’s Equations under which the electron current having a corresponding quantum of angular momentum allows acceleration without radiating energy. In multi-electron atoms, electrons form a series of concentric spherical shells. 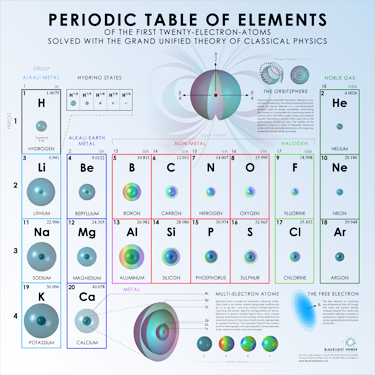 Each shell is an atomic orbital designated traditionally by 1s, 2s, 2p, etc..., and may contain multiple electrons matching the known electron configurations of atoms. 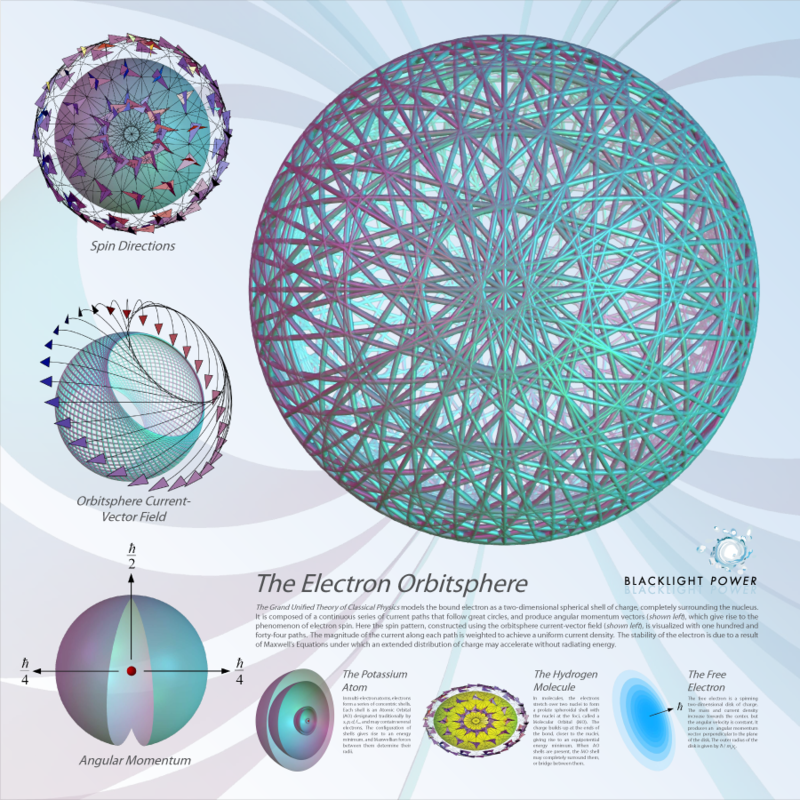 Electrons in atomic orbitals higher than s form charge density distributions on the surface of the shell that are spherical harmonic functions (traditionally represented as spatial functions). 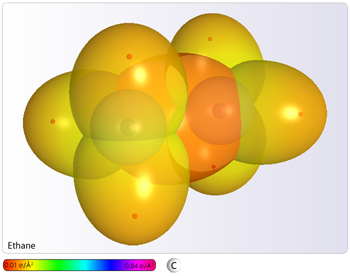 The coloumbic field of the nucleus and the diamagnetic and paramagnetic forces between shells determine their radii and energies. In molecules, the electrons stretch over two nuclei to form a prolate spheroidal shell with the nuclei at the foci, called a Molecular Orbital (MO). The charge builds up at the ends of the bond, closer to the nuclei, reducing the total energy of the system. The MO shell sometimes completely surrounds the AO shells, but more often bridges between them. View the Examples of Molecules page. Or, download a free trial of Millsian Software, with an extensive pre-built library. How does this effect molecular modeling technology? According to Millsian theory, atoms and bonds are made up of discrete surfaces of negative charge, not probability-density clouds. This gives Millsian the ability to calculate and render the exact charge distribution profiles for molecules of any size and complexity. Further, electrons are localized in molecules to specific regions, i.e. functional groups which act as building blocks, or independent units, in larger structures. Using two basic equations, Millsian has solved the important functional groups of chemistry, allowing molecules of arbitrary size and complexity to be modeled trivially and almost instantly on a personal computer. Millsian 2.0: A Molecular Modeling Software for Structures, Charge Distributions and Energetics of Biomolecules, W. Xie, R.L. Mills, W. Good, A. Makwana, B. Holverstott, N. Hogle, Physics Essays, 24 (2011), pp. 200-212. The Nature of the Chemical Bond Revisited and an Alternative Maxwellian Approach - R.L. Mills, Physics Essays, Vol. 17, No. 3, September (2004), pp. 342-389. View accompanying spreadsheets. How has Millsian theory been validated? Millsian theory generates predictions for thousands of energies, distances, angles, and dipole moments that have been rigorously compared to experimental data. This includes comparison to available data for over 800 molecules, sampling all major functional groups and compositions of matter. These values match experiment to within experimental uncertainty, often to much higher accuracy than possible with prior theory. 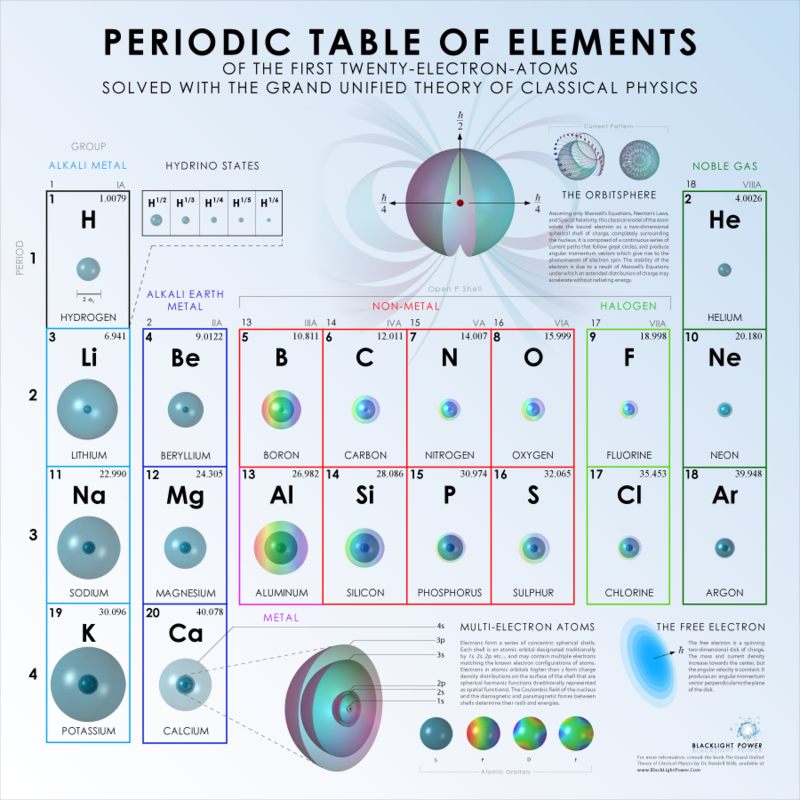 Some atomic predictions (such as the excited states of helium, ionization energies of multi-electron atoms, state lifetimes and line intensities of hydrogen) have never been adequately calculated before. Further, predicted values are deduced using closed-form equations containing fundamental constants only (no adjustable parameters or empirical corrections). The accuracy of Millsian predictions are limited only by propagation of error of the fundamental constants. Are Millsian results really derived from first principles? Yes! Millsian is based on a database of parameters calculated directly from physics, using only Maxwell's Equations and Newton's Laws. Further, the program performs some real-time calculations. By contrast, most other software relies on extended datasets of empirically-fitted values. Complete collection of Excel files (1,600+ files) used to solve molecules and functional groups using the GUT-CP. Complete collection of Excel files (900+ files) used to solve bond angles using the GUT-CP. Collection of Excel files used to solve bond moments of major set of functional groups. Where can I learn more about Millsian Theory?